Just yesterday Dr. Chris Ngige mistakenly mentioned his name and now he's sitting on the floor with armed men around him. These pictures are too real to be photo shopped. What is going on? Are these old pictures? He was taken to the state house clinic where doctors attended to him. A combined team of security operatives from the Department of State Services (DSS) and Nigeria Police Force, has laid siege to the Ekiti state government house. 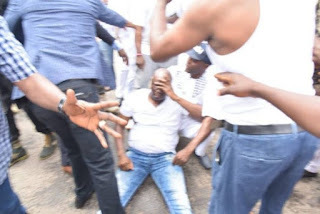 According to Fayose’s spokesperson, Idowu Adelusi, he described the act as an assassination attempt on the life of governor. 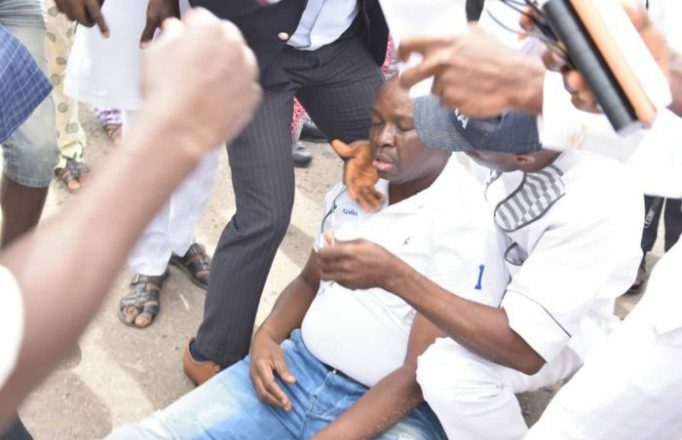 “The governor is currently receiving treatment at govt house clinic after he was hit by a teargas canister fired by the policemen. “The armed policemen are still laying siege at the Govt House, Ekiti State”, he said.